I don't know about you, but I always find it so refreshing when I look at someone out in public, and they genuinely smile at me. This is something that I'm working on too. I've MADE myself do it. I've always had a tendency towards shyness, it goes back to childhood. I tend to be more of a serious, get down to business type of gal. I like joining in the fun of things, but it's not usually me that starts it - well, sometimes I do. *hehe* After 27 yrs of marriage, my Honey's playful side has kind of rubbed off on me! Giving a smile to someone is so easy to do. You have to get your mind off your problems first, and think of others. Remember, there is always somebody worse off than you - and it may be the one you smile at today! You might make their whole day and encourage their heart to keep going, just through a simple smile. If ANYBODY should have a reason to smile, it is a Christian! But sadly, through circumstances, even they are caught dragging their lower lip sometimes. If you see one of those, give them a smile too! Because, we sure don't need to kick our wounded! Amen? It takes but a moment, but the memory of it sometimes lasts forever. None is so rich or mighty that he can get along without it and none is so poor but that he can be made rich by it. Give them one of yours, as none needs a smile so much as he who has none to give. 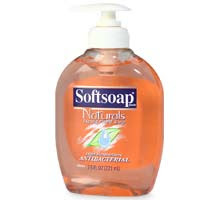 Have you caught any of the buzz about antibacterial hand soaps? These sort of health articles always interest me. Our daughter, Hannah, suffered with childhood cancer and is a survivor. I adopted many healthier habits during that time and have continued them. One of the things that has ALWAYS bothered me though, is the use of chemicals in hair and body products: soaps, lotions, shampoos, etc... I am NOT a germ-a-phobe by any stretch of the imagination. But I do like to wash my hands a lot to prevent illness. We are with people a lot and do a lot of hand shaking. I find that hand washing is one of the best ways to stay healthy. But they say you're not supposed to put anything on your skin that you can't eat. Well... I'd like to say I go that far, but the truth is I honestly can't afford to buy all natural everything. It's a bit pricier than the store brand. But I can still cut WAY back on the amount that I purchase. One of those I'm going to cut off is antibacterial hand soap. ANTIBACTERIAL SOAP -VS- REGULAR SOAP Sometimes plain old soap and other tried-and-true cleaning agents can work just as well as today's antibacterial products. 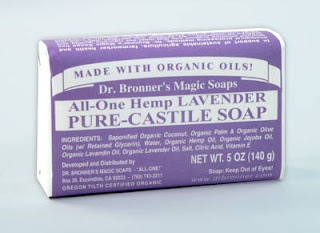 Good, old-fashioned soap may not say "antibacterial" on its label, but it still kills germs. Sometimes it does a better job than antibacterial soap. In addition, soap isn't the only thing that kills bacteria -- there are many naturally occurring antibacterial agents. Lemon juice, for example, changes the pH level in bacterial cells, creating an acidic environment in which microbes can't survive. Other naturally antibacterial substances dry cells out, killing the bacteria (bacteria most commonly thrive in moist environments). Still others, like bleach and alcohol completely obliterate the cells of the bacteria. Unlike the targeted attack of antimicrobial agents, bleach and alcohol simply cause the cells to lyse, or rupture. Why haven't bacteria adapted to the agents found in bleach, alcohol and lemon juice? The reason why bacteria aren't resistant to these agents is because they do not leave a residue. There is no chance for surviving bacteria to adapt within the residual environment, so bacteria are just as susceptible to bleach and alcohol as they were 100 years ago. Skip the antimicrobial smart bomb and go for the big bleach blockbuster. To read the full article concerning this health issue, go to: Should Antibacterial soap be outlawed? Just in case you don't get over to my cooking blog - I wanted to share this idea with you for an edible gift. It's the Traveling Treat Jar! The specifics for it are over on my other blog. Just click the link and it will take you there! Enjoy and have fun! OUT OF THE MOUTHS OF BABES again! Papa and Darren. I love this picture. It is big Darren (my hubby) and little Darren (my grandson). I always tell little Darren he's my favorite little boy and Papa's my favorite big boy! Little Darren (3 yrs old) said the the absolute funniest thing I've ever heard a little one say, the other night. My hubby had been out of town all week, and to celebrate his home coming, our grandson spent the night with us. We both absolutely adore him and will do anything to spend a little time with him. He lives next door, and after dinner last night, he came walking through the door with his little, Cars back pack on wheels. You could tell he was in high gear, all excited for an evening of play with Papa and MooMoo. We played on the floor for a while, pretending to be dinosaurs, roaring at one another, scaring one another and running away. Then I gave him piggy back rides and airplane rides on my feet while I was laying on my back. I get such a kick out his giggle when he is tickled about something. He seems to have appointed himself as my personal comedian lately! He will do anything to tease me or get me to laugh or play along with him. Anyway, I said to him, "Why don't we get jammies on?" He of course, wanted to "do it himself." I showed him how the tag on the bottoms went in the back by his bootie and the tag on the shirt went behind his neck and he thought that was pretty neat. I'm sure his Daddy and Mommy have already shown him that, but he got a kick out of it anyway! After he got his jammies on, he walked out into the kitchen, stood by my pantry, paused for a moment, clapped his hands then rubbed them together, and said, "Well, let's get started!" haha I thought I would die laughing!! It was like he was saying, I have an agenda here people, and only a certain amount of time to get it accomplished! haha That kid is too much! He has me in stitches all the time over things he says. But the best is when we are laying down for nap time together and he looks at me and smiles, then reaches over and rubs my cheek and says "MooMoo, you're so pretty, I love you." That thrills my heart for more than one reason: One - He has heard his Daddy say that to his Mommy and two - it shows, even at his tender age of 3, a love and compassion for people, a caring heart. That will be such a benefit to him in his adult years, if the Lord doesn't return before then. I'm telling you, grandkids are just the best! I'm so thankful to the Lord, every day for my precious grandbabies! They bring such joy to our lives, and smiles to our faces. Wow Check out this give away! This is one exciting give away going on over at Lizzy's blog! Can you imagine giving away such a work of art?! This is no small thing! I totally hope I win this beauty! Go check it out at Pigtails and Snails. She is a VERY talented lady and you'll enjoy looking through her blog! I was shocked to hear such hatred coming from such a young girl. A girl whose only concern should be what color of socks she is going to wear to school tomorrow, or how far her Mom will let her ride her bike today. What happened to the innocence of childhood? Sadly, in this little girl's life, it's been tainted by some hateful talk she's overheard in her home. I made her stop talking like that and urged her to not think about it or talk about it like that. I told her little girls like her shouldn't be worrying about politics, let the adults handle it. Little ones don't need such stress and worry in their lives. It was so sad, it just broke my heart for her. I asked my bus worker (a teen in the public schools here) if there was a lot of talk about the election in the high school and she said, "OH YES! And I'm so sick of it! The kids aren't even old enough to vote or have any say in it, but they insist on talking about it and choosing political sides. Some of them are really hateful about it." 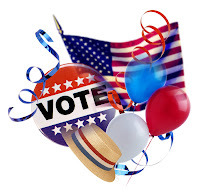 I am just so tired of all the mud slinging TV ads, newspaper articles, billboards, bumper stickers, yard signs, etc.... I don't even watch the debates, because you know BOTH of them speak out of both sides of their mouth! Oh I plan to vote - you can count on that! I don't know who will be voted in on Nov. 4 though, but you know what, whoever it is, God is still in control and like it or not, we'll get the leader we deserve as a nation. It's been so long since I posted on here. I thought I'd better pop back on and let you know I was still here. I've been busy over at my cooking blog, doing some downsizing and combining some things. I wanted to share this craft idea with you. It's easy, quick and inexpensive. Makes a cute gift for any time of the year. Fill the mason jar with the potpourri, nestle the votive holder into the top, add the candle, tie a sesonal ribbon around the top and VOILA! You have a cute, inexpensive gift to give. * I found these votive holders at Michael's craft store. But you could probably find them at any larger craft store. My jar doesn't have a Fall ribbon on it yet. I took the Summer ribbon off and haven't found a ribbon that I like yet, to replace it.